Black Bear Coatings & Concrete collaborates with New England’s top restaurateurs and commercial kitchens, to engineer and install customized restaurant flooring systems. Today’s concept restaurant such as open kitchen and hibachi style eateries require both function and fashion. From prep areas to dining spaces, we design restaurant flooring solutions that are both visually appealing and comply with rigorous health codes. Black Bear specializes in providing solutions for the restaurant & food services industry. We offer flooring that’s low-maintenance, durable, aesthetic, easy to clean, and meets industry regulations. 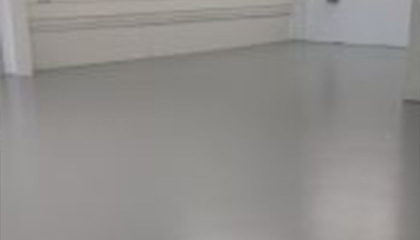 From stain and wear resistant dining area applications, to sanitary, non-slip flooring options for food prep stations, we have the insight and expertise to install the perfect floor on time and on budget. Black Bear’s timely completion of work minimizes disruption to your business. Our experience includes everything from thermal shock resistant flooring for high temperature cleaning and sanitizing, to decorative walkways and common areas. We can engineer a seamless look and feel that represents your establishment. Black Bear has engineered solutions for many restaurants in the New England area including: Bisousweet Bakery and Millennium Pharmaceuticals Cafe. 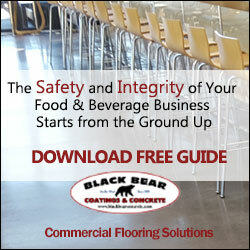 Talk to Black Bear about designing and installing a beautiful, durable surface for your restaurant. Fill out the online form and a client representative will be in touch. Or, please call 978-405-0017.